This term, Collaborative Project Group 6 enjoyed the visit of LSE Emeritus Professor aladin aladin. He introduced students to an interestingly unusual approach to market and customer research for business and innovation: a combination of critical ethnographical observation and neuroplasticity (brain science). 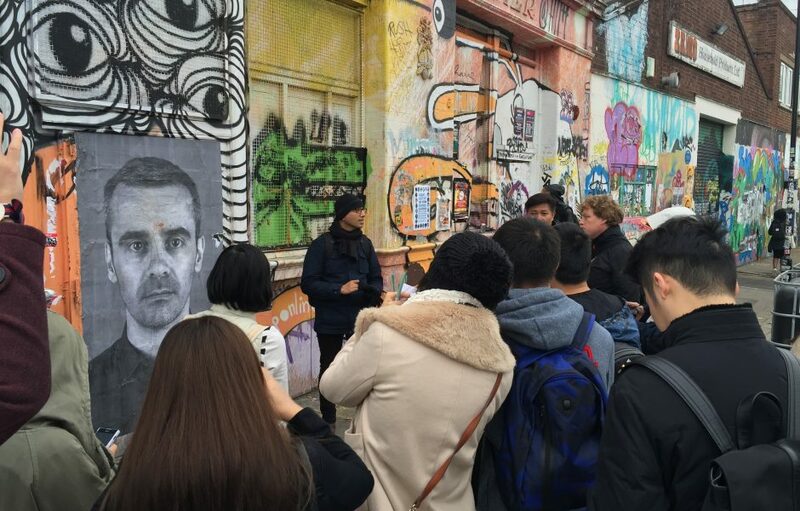 Students had the chance to experience a ‘contextual immersion’ through a guided exploration of the Hackney Wick neighbourhood, and learned about ‘ways of seeing with all senses’. The guided walk was entitled ‘WAYS OF SEEING: John Berger 50 years later’ as the widely popular 1972 BBC television series provided a rich source of inspiration and the theoretical grounds for this session. In this guest post, Professor aladin aladin reflects on his visit’s purpose and experience. Volatility and indeterminacy feel as if they are the default circumstances today’s innovators face and must rapidly acculturate to; there is a sense of inevitable rite de passage. Perhaps the dynamic relationship between the intertwined elements ‘stress’ and ‘creativity’ could even be termed an innovation calculus. Either way, being able to anticipate and prepare for choppy operational realities is critical if creativity and innovation are to flourish. When I was a child, I discovered John Berger’s work. I was hooked from the opening minute of the TV episode I caught; the accompanying book had its own magic. It added fuel to my already insatiable critical curiosity about how the world around me functioned; it sent me on new, exhilarating tangents of discovery and learning. I must share that my willfulness in this and the sheer velocity with which I went about things garnered their fair share of mishaps – which happily continue to accumulate and teach me. Berger’s variegated and humane way of seeing and decoding the manufactured visual landscape we live within was revelatory – and rightly inspired many. It was a radical and audacious apprenticeship in the habit of questioning. Continuing professional development can contribute to developing self-awareness of one’s own tendencies; it can help us become better attuned to discerning and recognizing how we are influenced by the choices and decisions of others. To develop more effective, conscious and responsible agency as innovative ‘designers’ or fashioners, we would do well to be bitten by the bug which makes us voraciously engaged with advancing our own progression. As Ways of Seeing is such a compelling example of – learning can be contagious, infectious and habit-forming. My intention with the masters students in this cohort was to remove them from the relative certainties of the classroom and expose them to Hackney Wick’s and my own uncertainties, real time/in the moment – and for this to be enjoyable. My part was unpremeditated and unprepared – there was neither curriculum or itinerary except to rely on my instinct to expose the students to unfolding events and vistas and continually press them about what was occurring in their thinking and feeling processes and to encourage them to delve beneath their initial responses to what they were experiencing. There were highlights aplenty – not least watching students re-calibrate, having their preconceptions shattered, finding it difficult to articulate or make intelligible what the session had disrupted yet seeded in them. More intimately, it was instructive to watch their dawning awareness of the very local, human implications of the gentrification sprouting out of the fissures and fault-lines of social deprivation and clash of social classes. Loughborough University London would like to thank Professor aladin aladin for his blog, and also thank all of City Insights for their participation in the Collaborative Project over the past two years. To find out more about City Insights, visit their website. To find out more about Professor aladin aladin, visit his LinkedIn.